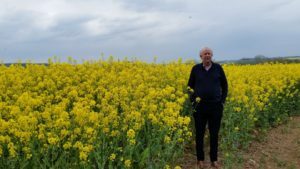 Paul Alexander, a Director of the newly-established Cross Slot UK Ltd, beside the 8th successive crop of OSR sown with Cross Slot low disturbance no-tillage in Oxfordshire. Paul, together with son James and wives Carol and Andi, formed Primewest Ltd, which is now becoming a part-owner of Cross Slot UK Ltd and a member of the Cross Slot Group of companies. Q 1. In a nutshell, what makes your company stand out from the crowd when it comes to Direct Drill machinery? A1. The world’s emphases on climate change and food security make it imperative that farmers (a) stop emitting CO₂ from the soil by repeatedly disturbing it (up to 20 % of atmospheric CO₂ comes from the world’s arable farmers tilling their soils), (b) stop oxidizing soil organic matter (75% of all arable soil organic carbon has already been lost by tillage), (c) start recapturing existing atmospheric carbon and putting it back into the soil, and (d) regenerate soil health to feed an increasing population. (i) Minimises oxidation of soil carbon. (ii) Facilitates the recapture of soil carbon by establishing the next crop through heavy residues. (iv) Secures seedling establishment at any practical soil moisture level in the absence of pests. (v) Sows seed and fertilizer (liquid or dry) with a single opener in separate bands. (vii) Maintains and usually increases crop yields. Q2. What product innovation has your company got in the pipeline? A2. Several refinements to the basic Cross Slot openers and drills are in the pipeline. A dedicated low disturbance direct drilling Cross Slot corn planter is also on the horizon. It will be the only corn planter in the world to be designed primarily for direct drilling, based on Cross Slot openers. Q3. Company background and history. A3. Cross Slot UK Ltd (based in Warwickshire) is a licensee of Cross Slot Europe (based in Prague) which itself is a licensee of Cross Slot IP Ltd based in New Zealand. These three recently-formed companies (plus several others including Untill Ltd in NZ) grew out of 23 years of experience by Baker No-Tillage Ltd in 20 different countries, Primewest Ltd in the UK, and Untill Ltd in NZ. The Cross Slot Group has restructured its commercial thrust by shifting marketing, servicing and client support functions to entities close to each market while the parent company and licensees concentrate on making the costs of Cross Slot openers and drill frames technically even better but also increasingly cost-competitive. To date, licenses have been negotiated for the entire American Continent, several countries in Eastern and Western Europe, the UK and Ireland, Australia and New Zealand, with more in the pipeline. The companies and technologies are the result of a 30-year research and development program at New Zealand’s Massey University that spent the first 20 years studying exactly what seeds required when sown into untilled soils and then the next 10 years creating direct drilling openers and machines, the designs of which were strictly governed by the results of the preceding biological research. The guiding ethos was that machine functions that had a proven effect on crop yield became standard and those that could be described as “operational” (excluding necessities such as wheels and a drawbar) became optional. A4. Since food is the fuel of all health and the world’s population is widely predicted to increase by 50% by 2050 and at the same time the area of arable land will continue to decline and at the same time 85% of the world’s food will likely continue to come from arable land; unless we find ways and means of producing higher yields from our existing arable crops we are heading for a period of widespread hunger in the world. When direct drilling first became practical in the UK following the advent of paraquat in the 1960s, followed by glyphosate in the 1970s, there was widespread expectation that the new technique would decrease soil erosion and costs and increase crop yields. It certainly decreased soil erosion and costs, but despite a steadily increasing adoption of a range of conservation tillage practices worldwide, crop yields have remained almost static for the past 20 years. This suggests that direct drilling and conservation tillage in general have not yet had the beneficial impacts on soil productivity that they were expected to have had. Cross Slot® is the first of a new generation of direct drilling machines that is focused on regenerating soil health and with it crop yields. Just stopping ploughing is not enough. Nor is adopting Minimum Tillage or Strip Tillage, even although all three of these actions slow soil degeneration down. Only Low-Disturbance Direct Drilling with residue retention and cover cropping will truly and cumulatively regenerate soil health and with it, increase crop yields and human health. Q5. What are we looking forward to at Groundswell 2019? A5. Seeing how close competing technologies (including those that are copies of other people’s designs) come to emulating Cross Slot’s soil functions.